267 Beacon is located on the south side of Beacon, between Dartmouth and Exeter, with 265 Beacon to the east and 269 Beacon to the west. 267 Beacon was built ca. 1871, one of four contiguous houses (263-265-267-269 Beacon) designed as a symmetrical composition, with 263 and 269 Beacon having two-story oriels, defined mansards, and slightly projecting facades, and 265-267 Beacon having one-story oriels. The houses were built on land purchased from the Commonwealth of Massachusetts on January 19, 1871, by dry goods merchant Eben Dyer Jordan, co-founder of the firm of Jordan, Marsh & Company. He and his wife, Julia M. (Clark) Jordan, lived at 46 Beacon. Click here for an index to the deeds for 267 Beacon. In his Houses of Boston’s Back Bay, Bainbridge Bunting indicates that 263-265-267-269 Beacon were built by building contractor George Wheatland, Jr., four of more than 140 houses which Bunting indicates George Wheatland, Jr., built in the Back Bay and Bay State Road neighborhoods between 1867 and 1907. George Wheatland, Jr., usually held an ownership interest in the land where he built houses. In this case, however, he did not, and it appears he built the houses under contract to Eben D. Jordan. After the houses were completed, George Wheatland, Jr., and his wife, Florence Saumarez (Dumaresq) Wheatland, leased 265 Beacon from Eben D. Jordan. Florence Wheatland’s brother, Herbert Dumaresq, lived with them and in June of 1873 married to Eben D. Jordan’s daughter, Julia Maria Jordan. On October 17, 1874. 267 Beacon was purchased from Eben D. Jordan by Edward Frothingham. He and his wife, Eugenia (Mifflin) Frothingham, made it their home. They were living in Paris in November of 1874 when their daughter, Eugenia Brooks Frothingham, was born (she would become a novelist and leader of the Women’s suffage movement). The Frothinghams continued to live at 267 Beacon in 1887, but during the 1887-1888 winter season were living elsewhere and it was the home of Alfred Perkins Rockwell and his wife, Katharine Virginia (Foote) Rockwell. They had lived at 3 Fairfield during the 1885-1886 season, and then traveled in Europe. Alfred Rockwell was a professor of mining at MIT in the early 1870s, having held a similar position at Sheffield Scientific School in New Haven in the late 1860s. Following the Boston Fire in November of 1872, he was appointed Chairman of the Boston Fire Commission. From 1876 to 1879, he was president of the Eastern Railroad, and from 1879 until his retirement in 1886, he was treasurer of the Great Falls Manufacturing Company, a textile firm. By the 1888-1889 winter season, the Rockwells had moved and then traveled abroad once again, and by the 1890-1891 season were living at 9 Exeter, the home of Edward Frothingham’s unmarried sister, Ellen Frothingham. 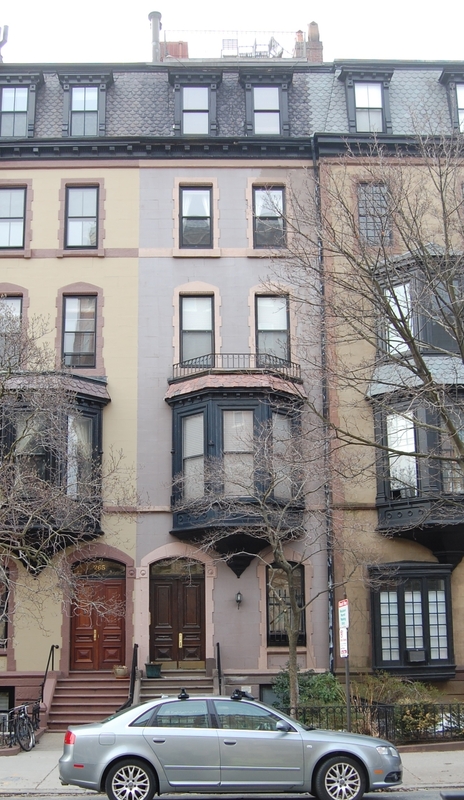 Edward and Eugenia Frothingham resumed living at 267 Beacon during the 1888-1889 and 1889-1890 winter seasons, after which they moved to 210 Beacon to live with his nephew, Gorham Hubbard, and his wife, Sarah (Henshaw) Hubbard. By the 1893-1894 season, the Frothinghams had moved to a new house they had built at 476 Beacon. On October 3, 1890, 267 Beacon was acquired from Edward Frothingham by Alice Dexter (Fay) Otis, the wife of Dr. Walter Joseph Otis, a physician. They previously had lived at 270 Clarendon. They continued to live at 267 Beacon until late 1896, when they moved to Europe and he engaged in advanced medical studies and original research in anatomy and embryology at the University of Vienna. After their return to the United States in 1905, he practiced medicine in Worcester. By the 1897-1898 winter season, 267 Beacon was the home of Dr. George Howard Monks and his wife Olga (Gardner) Monks. They had married in June of 1897 and 267 Beacon probably was their first home together. George Howard Monks was a surgeon, specializing in plastic surgery, and was a professor of surgery at Harvard Medical School and Harvard Dental School. The Monks continued to live at 267 Beacon during the 1900-1901 winter season, but moved thereafter to 67 Marlborough. 267 Beacon was not listed in the 1902 Blue Book. By the 1902-1903 winter season, it was the home of Dr. Hugh Williams, a surgeon, and his brother, Moses Williams, Jr., a lawyer. 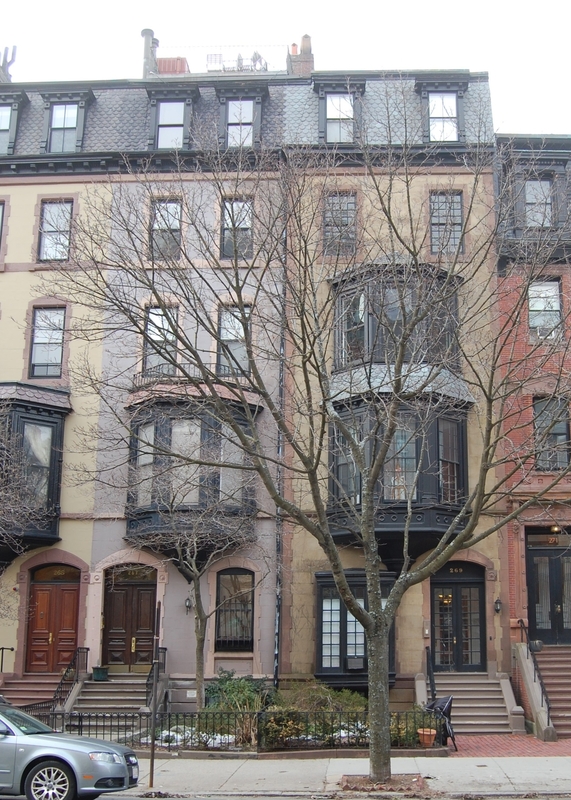 They previously had lived with their parents, Moses and Martha (Fininley) Williams, at 234 Beacon. Also living at 267 Beacon were Frederic Sprague Goodwin, an attorney, and Miss Goodwin, probably his sister, Fannie Goodwin. In 1900, they had lived at 55 St. Stephens with their widowed father, James Frederic Goodwin, a deputy sheriff. He had died in May of 1901. Moses Williams, Jr., married in March of 1905 to Anne Henrietta (Nancy) Whiteside. After their marriage, they moved to Westwood. Hugh Williams and Frederic Goodwin continued to live at 267 Beacon. In 1906, they were joined there by Dr. Freeman Allen, a physician. In mid-1907, Dr. Williams purchased and subsequently moved to 301 Beacon. Frederic Sprague moved there with him. Freeman Allen moved to 5 Mt. Vernon, where he also maintained his office, and then, by 1910, to 200 Beacon. By the 1907-1908 winter season, William and Alice Otis had moved back to 267 Beacon. Alice Otis died in January of 1909. Soon thereafter, Walter Otis and their two daughters, Marghretta Adams Otis and Rosamond Fay Otis, returned to Europe. 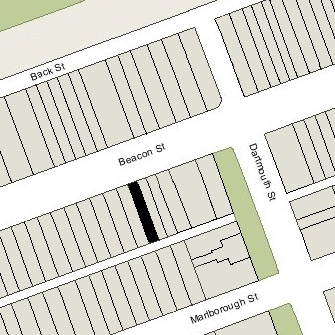 267 Beacon had been inherited by Marghretta and Rosamond Fay, and they leased it to others. 267 Beacon was not listed in the 1910 Blue Book. During the 1910-1911 winter season, 267 Beacon was the home of Mr. and Mrs. John Lawrence, probably John Lawrence and Martha Endicott (Peabody) Lawrence. Their primary residence was in Groton, where he owned a farm; he also was a trustee with offices in Boston. During the 1911-1912 winter season, Dr. Otis and his daughters were living there once again. They returned to Europe in the spring of 1912. During the 1912-1913 winter season, 267 Beacon was the home of real estate investor Stephen Westcott Sleeper, and his wife, Eliza Harriet (Cushing) Sleeper. They had married in June of 1911; prior to their marriage, he had lived at 336 Beacon with his mother, Maria A. (Westcott) Sleeper, the widow of Jacob Henry Sleeper, Jr. Stephen and Eliza Sleeper had moved from 267 Beacon by the 1913-1914 season and by 1915 were living at 12 West Cedar. 267 Beacon was not listed in the 1914 Blue Book. By the 1914-1915 winter season, 267 Beacon was the home of stockbroker and banker Joshua Bennett Holden, Jr., and his wife Mabel (Bonsal) Holden. They previously had lived at 337 Commonwealth. They continued to live at 267 Beacon during the 1917-1918 winter season, but moved soon thereafter and by January of 1920 were living at 265 Clarendon. 267 Beacon was not listed in the 1919 Blue Book. During the 1919-1920 winter season, 267 Beacon was the home of Mrs. Gertrude (Robbins) Caswell, wife of John Caswell, and their two children, John Caswell, Jr. and Elizabeth Robbins Caswell. John Caswell, Sr., was a real estate broker and noted big game hunter. During the 1920-1921 winter season, 267 Beacon was the home of banker Jonathan Stone Raymond and his wife, Pauline (Pollard) Stone. In January of 1920, at the time of the US Census, they were living in Beverly. By the 1921-1922 winter season, they had moved to 13 Marlborough. During the 1921-1922 winter season, 267 Beacon was the home of Alfred Elmer Stockbridge and his wife, Irene (Wall) Stockbridge. In 1921, they had lived in Somerville. Alfred Stockbridge was president and treasurer of the Magee Furnace Company. By 1923, they had moved to 78 Bay State Road. During the 1922-1923 winter season, it was the home of wool merchant Matthew Luce and his wife, Mary Cobb (Hovey) Luce. During the 1920-1921 season they had lived at 37 Marlborough. By 1924, they had moved to 250 Commonwealth. They also maintained a home in Cohasset. 267 Beacon continued to be owned by the Otis family. Rosamond Otis married in January of 1912 to Alfred Wilhelm Franz Mallman of Mattersdorf, Bohemia, and Marghretta Otis married in October of 1920 to Hans Wickenhauser of New York City. On June 16,1923, they transferred their interest in 267 Beacon to their father, a resident of Brookline, who sold it on June 22, 1923, to Charles Edward Hodges, Jr.
Charles Hodges, Jr., and his wife, Mary E. (Neal) Hodges, lived at 267 Beacon during the 1923-1924 winter season. They previously had lived in Manchester. Charles Hodges was Vice President of the American Mutual Liability Insurance Co. They continued to live at 267 Beacon during the 1924-1925 season, but moved to Beverly thereafter. On September 30, 1925, 267 Beacon was purchased from Charles Hodges, Jr., by Frederick Josiah Bradlee, Jr., an investment banker and trustee. He and his wife, Josephine (de Gersdorff) Bradlee, made it their home. They previously had lived in Southborough. They also maintained homes in Marblehead (listed in the 1926-1929 Blue Books), Manchester (1931), and Beverly (1932-1937). Frederick and Josephine Bradlee’s son, Benjamin Crowninshield Bradlee, later became editor of The Washington Post. On September 8, 1931, Frederick Bradlee transferred the house into his wife’s name. They continued to live at 267 Beacon until about 1947, after which they moved to an apartment at 280 Beacon. On June 4, 1947, 267 Beacon was purchased from Joseph Bradlee by John Griffith Booton and his wife, Gertrude Vedder (Vermilye) Booton. They previously had lived in Springfield. John Booton was a career military ordnance officer. He retired in 1947 with the rank of Colonel and became a purchasing agent for Hollingsworth & Whitney Company, paper manufacturers. John Booton died in May of 1961, and Gertrude Booton continued to live at 267 Beacon until her death in August of 1983. On April 24, 1984, 267 Beacon was purchased from Gertrude Booton’s estate by Rupert R. Gildenhuys, trustee of the Eagle Holdings Trust. On September 6, 1984, 267 Beacon was acquired from Joseph G. Bramberg, successor trustee of the Eagle Holdings Trust, by the 267 Limited Partnership (Samuel I. Stone, general partner). In March of 1985, it applied for permission to demolish the existing garage at the rear and replace it with a new garage. The application was denied and the Board of Appeal dismissed the appeal. On November 15, 1985, the 267 Limited Partnership converted the property into three condominium units, the 267 Beacon Condominium.